The Replacement Bumper style SWC comes with optional left and/or right SWC arm kits or Jerry can holder. The SWC mounts are adjustable to suit a wide range of wheel diameters and offsets, including 35″ tyres. The bumper is chassis mounted, and Hilift Jack lifting points are fabricated into the outer ends of the new bumper. 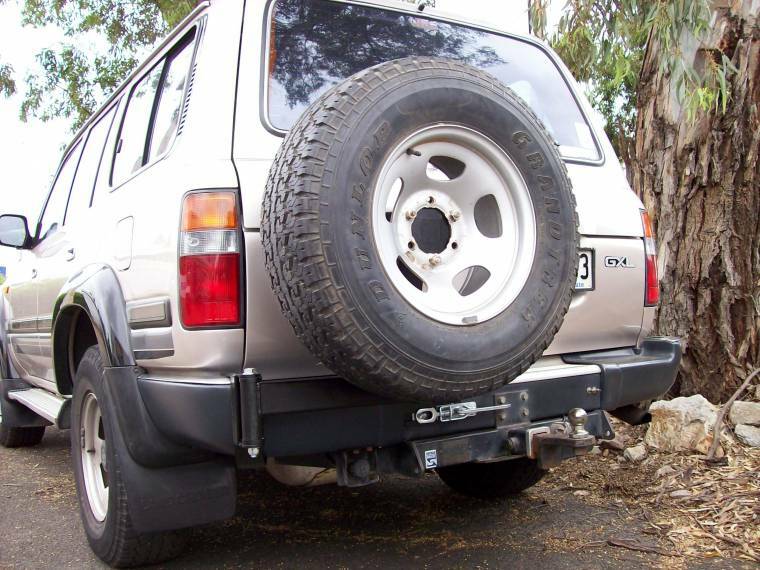 The original towbar is retained, as are the factory mud-flaps. New slim multi-LED lamp and wiring kits are supplied in the DIY kit, instructions included. 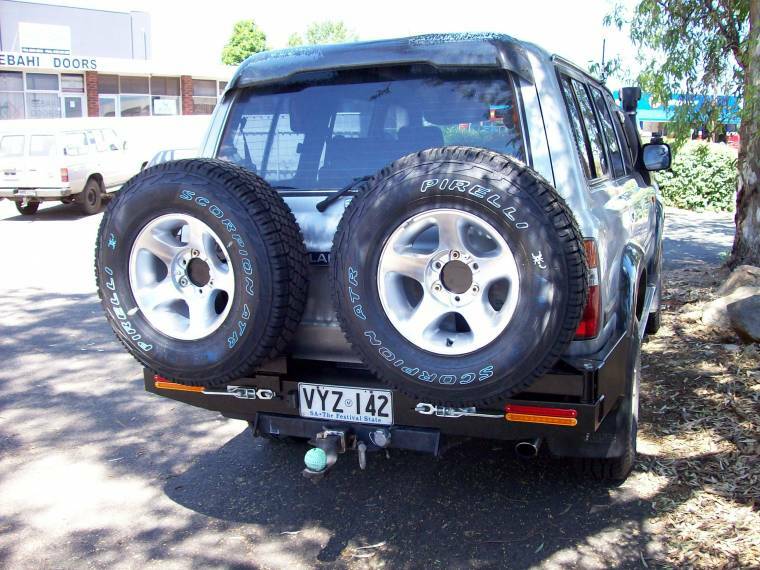 These are quality Australian Manufactured, have a 3 year warranty even with 35″ tyres. Anti-corrosive undercoat and Powder Coated in black final coat. The Registration plate is usually fitted onto the centre of the new bumper, supplied with light kit. A further option is a High Lift Jack holder. This holder supports the jack, and can be padlocked for security. Every unit is supplied with a complete DIY kit including instructions and hi-tensile zinc plated nuts & bolts. The Spare Wheel Carrier suited to existing bumpers are a chassis mounted swing away system, designed for rugged off-roading and easy everyday use. The design means nearly all of the mounting system is hidden behind the spare wheel and underneath the vehicle so it looks good. The light weight structure means you can enjoy the benefits of a spare wheel carrier without the need to upgrade your suspension system. The hinged bush mounting system is extremely durable and will support heavy loads including big tyres and high lifting jacks. The bush is manufactured from a special polyurethane requiring minimal maintenance and is adjustable so that the arm can be swung into a position and stay there (even on slopes). 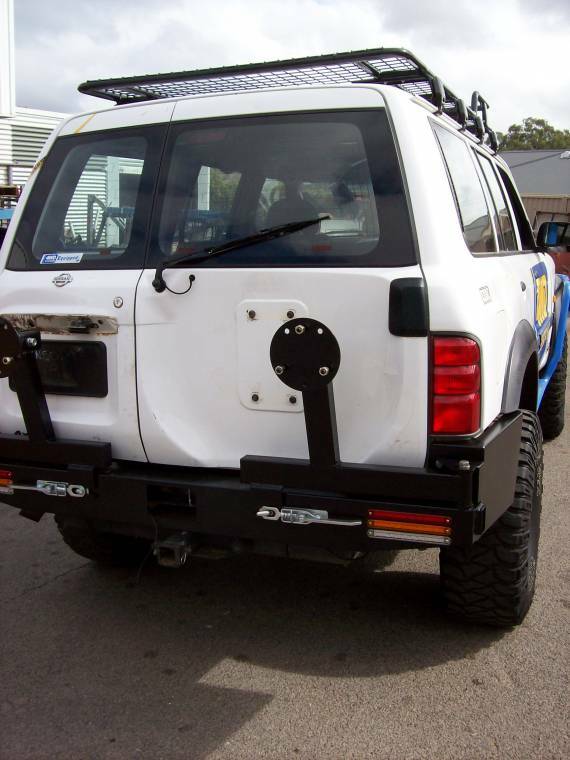 Using an 'over centre' locking system, we have eliminated the most annoying aspect of spare wheel carriers - there are no squeaks or rattles, and your spare is fastly mounted even on the most arduous of corrugated bush tracks. Popular models are available for both passenger or driver side mounting to suit the variety of rear door arrangements and personal preferences. 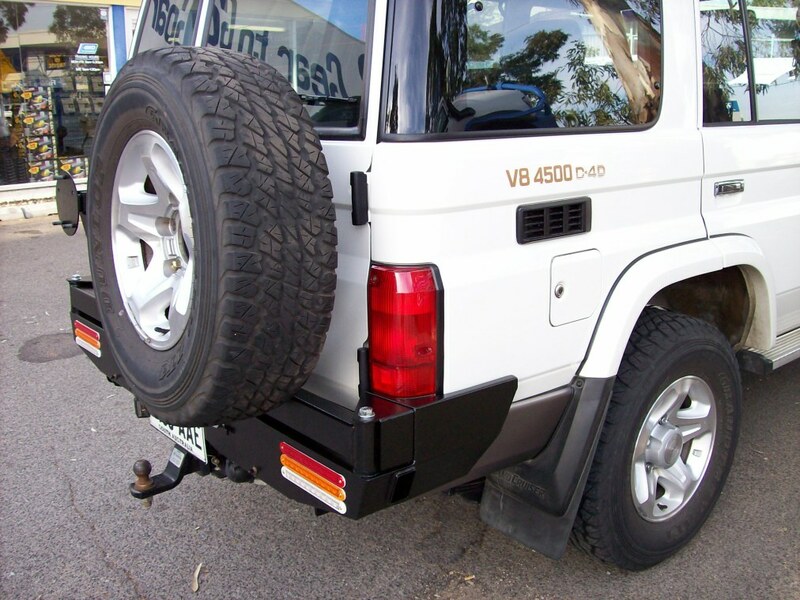 The 4WD Systems Spare wheel carrier is finished in a high quality, long lasting, black powdercoat with a zinc pre-treatment for corrosion resistance. The design allows a wide variety of rim and tyre combinations to be mounted by simple adjustment. An optional registration plate and light relocation mounting kit can be supplied if required. A further option is a High Lift Jack holder. This holder supports the jack, and can be padlocked for security.